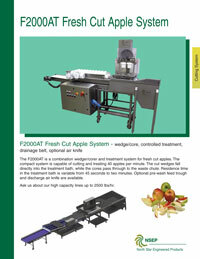 The F2000AT is a combination wedger/corer and treatment system for fresh cut apples. The compact system is capable of cutting and treating 40 apples per minute. The cut wedges fall directly into the treatment bath, while the cores pass through to the waste chute. Residence time in the treatment bath is variable from 45 seconds to two minutes. 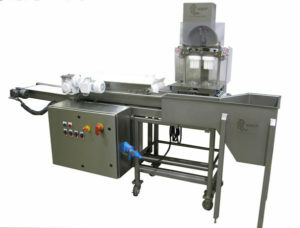 Optional pre-wash feed trough and discharge air knife are available. Ask us about our high capacity lines up to 2500 lbs/hr.